This page is designed to accompany my gallery on Flickr detailing the various locomotives in Australia. A short description and a link to the appropriate photo set is planned for all locomotives, however I am limited to the locomotives I can actually access! Heritage locos may or may not be included on a case-by-case basis depending on the kind of work they do (or have done in the past). An ever-expanding collection of Australian motive power. It is organised by the origin of the engine inside the locomotive. Given that NSW (where I live) is dominated by diesel haulage, I felt this was the most appropriate way to organize the collection, as electric locomotives have long since fallen by the wayside (unless of course one is talking about QLD coal haulage). It was not appropriate to organise motive power by the operator, as this is always in a state of change – today’s Silverton Cs Class locomotive is now tomorrows Coote Industrial C Class! Long-time viewers of my Flickr might have noticed that this organisation has changed from the previous method, which was to organize locomotives based on the state in which they were built and spent most of the time working. This proved to be problematic, with locomotives for other state government railways being built in states other than their “home”, and especially so in the era of privatization, with locomotives being introduced from overseas builders. 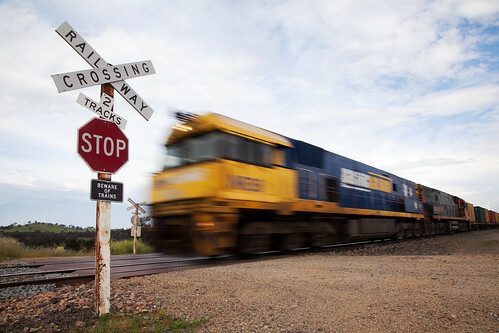 Rebuilt locomotives (such as the 423 and GL Classes) are listed under their date of introduction after rebuild, while second-hand introduced locomotives (such as the 14 Class) are listed as when they began work in Australia. Astute readers amongst you will notice a fair few classes missing – this is likely because I simply have not had a chance to photograph them yet! When I do eventually get a chance to capture these locomotives, they will no doubt appear here. I like the movement in this pic. Top stuff!